Our state-of-the-art UK warehouse and its satellites, operate using our networked warehouse management system. The main warehouse was designed and custom-built in 2004 specifically to provide full support for the different profiles of book and journal publications. We employ the most modern practices and sophisticated software tools for the efficient management and despatch of all product types. 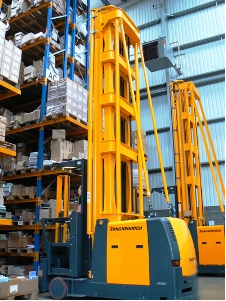 Our warehouse system uses hand-held radio frequency terminals and allows stock to be held in multiple sites. The system tracks a publication throughout the storage and despatch process from ‘goods-in’ to stock location, to picking, packing and shipping, and finally to track and trace. • We can handle the physical main label runs and/or catch-ups and despatch or transmit labels to your printers, depending on publisher’s location and preferences. • We use bar codes and a stock location license for all items to ensure that stock is easily accessible and identifiable as belonging to you. • Invoice, label and packing note documentation is generated after the order has been picked to ensure accuracy. • Automatic generation of commercial invoices for shippers/freight forwarders. • Automated email reports advise the publisher when stock is received and when low-stock levels are reached. • We use multiple shipping methods and/or carriers dependent on the destination. • Our automated film wrapping machine capable of packing up to 50 journal issues per minute. • Bibliographic detail, prices and price types, stock out on consignment, stock in returns and stock sold. • Unit costs, low stock flags, print runs and replenishment stock, standing order details for series and date released, main run mailing dates for journals, reports on packages, sets or series and related titles.